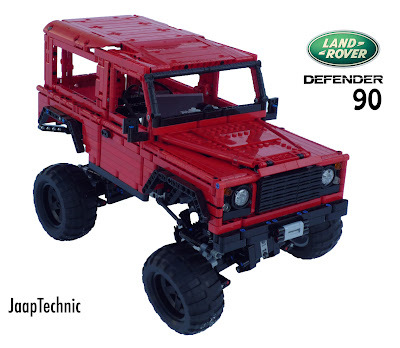 I have entered the Lego You-Design-it-We-Make-it competition with a grey version of this Landrover Defender 90. The grey version ended second in the competition but because of license rights it didn't went for final voting in the top 10. Because the old grey version was very popular i decided to redesign the old grey Landrover Defender 90 to make it more powerful. To do this i added 2 XL power-functions motors in the chassis of the official lego technic model 9398. Also the body is redesigned. The old grey Landrover Defender 90 was a bid heavy because a lot of unnecessary bricks. The new red version has less bricks and almost the same shape. This made the body a bit lighter so it was possible to mount suspension which is less stiff. There are several building instructions available of my Landrover Defender 90 serie. In the video you can see how it performs against the opponents of nature. Excellent models... Especially the bodywork/styling. Most realistic models I've seen. How can I buy this instruction?